tmux is useful to people in different ways. To me, it’s most useful as a way to maintain persistent working states on remote servers—allowing you to detach and re-attach at will. You could, for example, have a session on your server for hacking on a node REST API (my current project), and call it “nodeapi”. And let us say that you are compiling something for it that will take two hours (work with me), but you’re currently working at a coffee shop and you have to leave. tmux lets you simply detach from that session and come back to it later. Others like to focus on how you can use tmux to have multiple panes within multiple windows within multiple tabs within multiple sessions. I don’t do that. I like fewer of those—as few as possible, actually—and this guide will be focused on a simple persistent-remote-sessions model. Mobility is a central theme for tmux users. Many developers do all of their work from the server, and simply connect in from $wherever to do it. 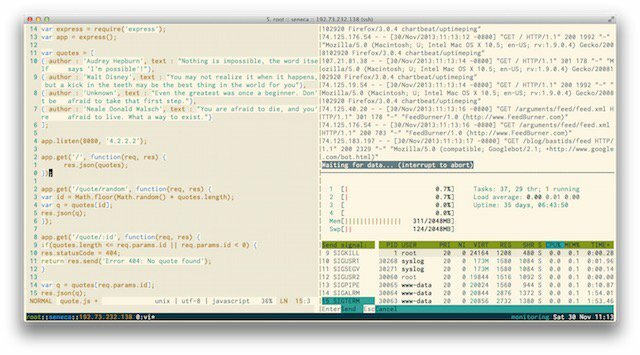 tmux (and similar tools) allow you to work from a coffee shop in SF, start something building on the server, disconnect to take a flight, and then pick up that same task on the ground in NYC when you land. A related advantage to this mobile approach is the fact that your client machine is not too terribly important. You can upgrade your laptop, clone a repo with your vim/tmux dotfiles in it, and you’re back to your optimum computing environment in minutes rather than days. Anyway, those are some reasons that people love tmux, but you don’t have to make this lifestyle change in order to see its benefits. Why do I try to tmux other than terminator? Because I sometimes need to ssh, ssh, …… and ssh to my destination server. And tmux could help you directly split panels with one shared ssh connection. Now is a good time to mention that there is a universal tmux shortcut that lets you quickly perform many tasks. … followed by a number of options that we’ll talk about below. But get ready to use that Ctrl-b combo. Also consider remapping CAPSLOCK to CONTROL within your operating system; it makes the pinky walk for Ctrl-b quite nice. Right then. Let’s start by running tmux. You want to do this from the system that you want to detach and re-attach to which for me is usually a remote server. Simple enough. You now have a tmux session open that you can disconnect from and come back to later. Since the idea of tmux is having multiple sessions open, and being able to disconnect and reconnect to them as desired, we need to be able to see them quickly. Now we’re going to create a new session. You can do this with just the new command, or by providing an argument to it that serves as the session name. I recommend providing a session name, since organization is rather the point of tmux. Since we’re going to be creating sessions with names, and we may have more than one, we want to be able to attach to them properly. There are a couple ways of doing this. You can simply type tmux a and it’ll connect you to the first available session. Or you can attach to a specific session by providing an argument. You can detach from an existing session (so you can come back to it later) by sending the detach command. Or you can use the shortcut. 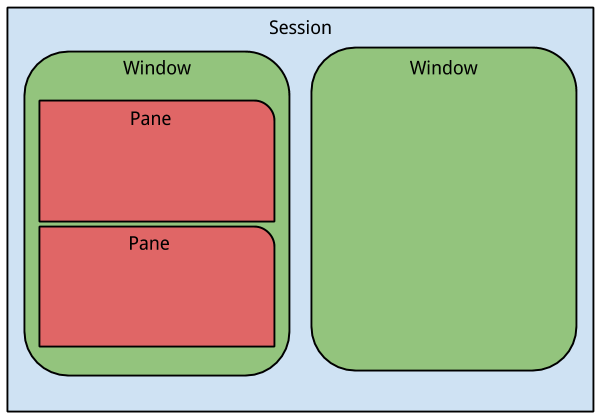 tmux sessions have windows, and windows have panes. Below you can see how how I conceptualize them although if anyone has a more authoritative or useful hierarchy I’ll happily embrace it.